The theme of this Royal Jewel Cabinet from France, dated 1824-26, is no doubt indulgence in all forms – especially love and extravagance. Its rich iconography displays symbols of love and jewels, where antiquity is mixed with early-nineteenth century depictions of flowers. The cabinet is constructed of porcelain plaques in a gilt-bronze armature. A golden peacock crest rests atop the upper section, while the lower section sports two ceramic columns and two drawers. Roman goddesses Venus and Psyche are portrayed in the large central panels, each at their toilette encircled by related gods and goddesses, each connected to the theme of love. Venus, the goddess of love, puts on an earring while attended by three cherubs and a dove at her feet. Psyche, the goddess of the soul and wife of Cupid, is similarly attended by cherubs on her panel. Both goddesses are encircled by medallions of related figures interspersed with bunches of flowers including roses, another symbol of love related to Venus. The use of decorative motifs surrounding the goddesses such as jewels and other treasures reinforces the cabinet’s use as a haven for jewelry. A joint design and manufacturing effort between nearly fifteen different French designers, this jewel cabinet was produced by the Manufacture nationale de Sèvres, located in Sèvres, Hauts-de-Seine, France. Founded in 1740, the Sèvres factory became a royal manufactory in 1759 with the support of Louise XV and Madame de Pompadour. In 1830, this cabinet was presented as a gift from Charles X to Francis I, King of Naples and of the Two Sicilies. Due to the large expense and investment of time, few cabinets of such majestic size and decoration were made during this period. New formulas for porcelain and glazes were introduced in the early nineteenth century, making possible the large size of the plaques. The new ceramic technology, combined with larger kilns and even temperatures also resulted in high temperature durability, crisper definition, and brighter colors. Work on the cabinet began in 1825, but the components were conceived as early as the prior year. The Vicomte de la Rochfoucauld is responsible for the selection of the mauve background in the door panels, which were first constructed in 1826. At the end of the same year, the cabinet was finished and was priced at 24,000 francs. The cabinet majestically combines art, science, and business to make an extraordinary statement perfectly suited as a royal gift. Erin Benedictson is an intern in the Product Design and Decorative Arts department at Cooper Hewitt, Smithsonian Design Museum. Sarah D. Coffin, “Jewel Cabinet on Stand, 1824-26,” in Making Design, Cooper Hewitt Smithsonian Design Museum (New York: Cooper Hewitt Smithsonian Design Museum, 2014), 574. Thomas Bulfinch, The Age of Fable; or, Stories of Gods and Heroes, 3rd edition (Boston: Sanborn, Carter, Bazin and Company, 1855), 115-28. Sarah D. Coffin, “Jewel Cabinet on Stand, 1824-26,” in Making Design, Cooper Hewitt Smithsonian Design Museum (New York: Cooper Hewitt Smithsonian Design Museum, 2014), 572. 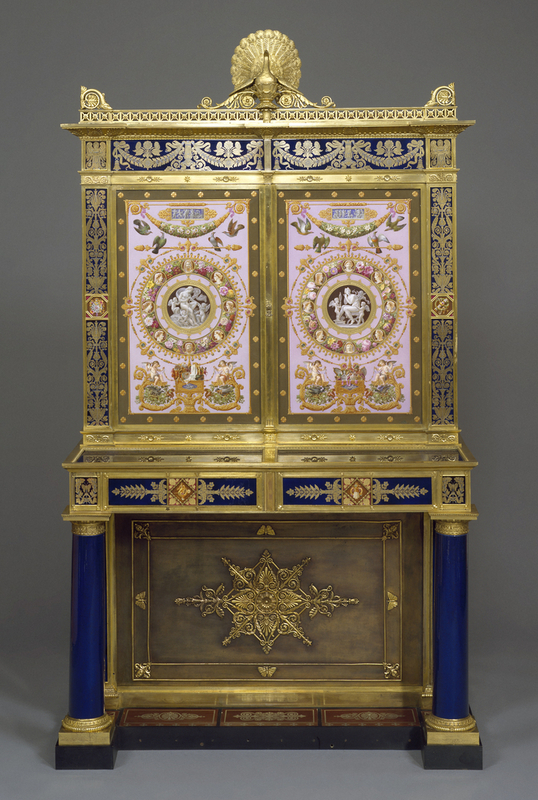 Sarah D. Coffin, “Jewel Cabinet on Stand, 1824-26,” in Making Design, Cooper Hewitt Smithsonian Design Museum (New York: Cooper Hewitt Smithsonian Design Museum, 2014), 576.